I pray each of you were truly blessed by Christ during the Christmas season and wish everyone of you a healthy and prosperous New Year! I am praying the Lord would increase our belief in His ability to supernaturally intervene and do the impossible! We bind all assignments of the enemy and we loose the power of the Holy Spirit to work in us and through us so we OVERFLOW in prayer to change the moral and spiritual downward spiral of our state, nation, and the world! We must be in continual prayer for those in authority over us. WE have plans, but we offer them to the Lord in prayer so that His will may have priority. 2015 was a year of intense pressure, opposition, and contending, but the Lord is calling us to a place of REST in Him in 2016! As we pursue and persist in prayer with HOPE, we can expect the Lord to show up. 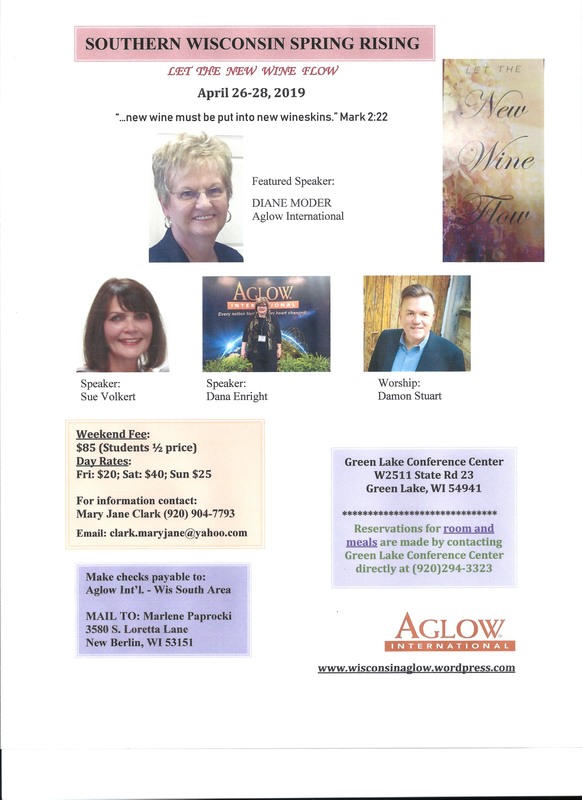 This month, please pray for all Aglow International Leadership, especially Jane Hansen Hoyt and her entire leadership team throughout our nation and world. We pray for anointing, direction, wisdom, protection, and strength, for Dana Enright, our Aglow International US Regional Director, as she ministers to all of us! We pray blessing, favor, and wisdom for the North and South Area Teams as they make plans and prepare for retreats and meetings in 2016. Please pray for Lighthouse Teams and attendees. We praise the Lord, for our Operation 222 Directive to pray for Taiwan! Aglow has been established in the capital city of Taipei! We were able to meet with Aglow Leadership from Taipei at our Regional Directors meeting at the Worldwide Aglow International Conference in Indianapolis in November! Even though Aglow has been established there, I would like to ask each of you to continue to pray for God to continue to multiply Aglow in Taiwan! 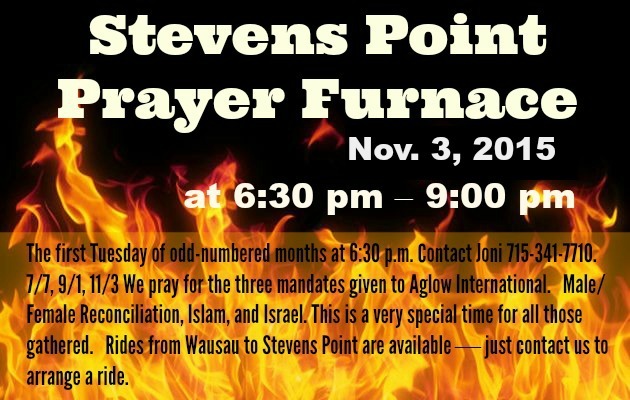 Please pray for the men and women of Wisconsin to embrace the Aglow I-Mandate in Wisconsin. We are looking for those with hearts of intercession to join us in monthly gatherings as members of SWIFT Teams. Are you one the Lord is calling to intercede on behalf of the Muslims? Please give me a call or email if you are interested! One last item. Capitol Prayer takes place at the Capitol every first Friday of the month. It is from 12:00-2:00 PM in Room 415 NW. We would love for you to join us in praying for our Governor, senators and legislators, and our courts, as well as other issues going on in our state. Ephesians 6:18 Pray in the Spirit on all occasions with all kinds of prayers and requests. It tells us to plead with Him, reminding Him of all our needs and to pray earnestly for all everywhere. Our dependence and confidence is based solely on who He says He is. He is a God of covenant and will not let us down! Thank you for praying in unity with the help of the Holy Spirit as we persist in desiring the Lord’s will to be done in each of us and our sphere of influence.